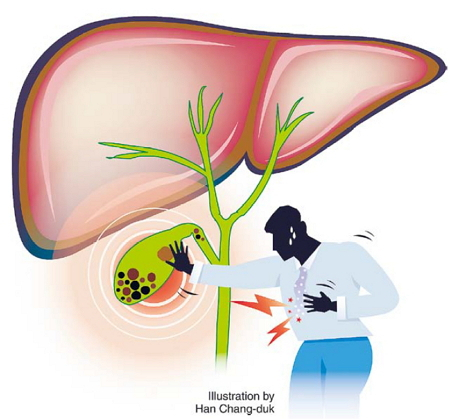 Bile is made in the liver and stored in the gall bladder. It is secreted into the duodenum as the gall bladder contracts when food is consumed, aiding in digestion. Gallstones refer to stone formations in the duct that the bile flows through. Depending on its location, it can be categorized as an intrahepatic gallstone, ductal stone or gall bladder stone. Of these, stones are most commonly found in the gall bladder. There are various types of gallstones, such as cholesterol stones, pigmented stones and mixed stones. Cholesterol stones are due to abnormal metabolism of the cholesterol by the liver, or due to the dysfunction of the gall bladder leading to stasis of the bile in the gall bladder. The relative concentration of other biochemical substances within the bile is also important. Stasis of bile within the gall bladder or dysfunction of the gall bladder is seen in people who are fasting, pregnant or obese or have female hormone abnormalities, nerve blocks, an abnormal level of red blood cells, spinal damage or diabetes. The main causes of pigmented gallstones are hemolysis of red blood cells in the blood and bile infection. Stones from infections are brown in color, whereas those from hemolysis are generally black. The symptoms of gallstones range from mild dyspepsia to discomfort or even severe upper abdominal pain. Complications of gallstones include cholecystitis and cholangitis. If not treated appropriately, it can progress to jaundice, liver abscess and sepsis. The first line treatment for symptomatic gallstones is laparoscopic cholecystectomy. Surgery is indicated even if there are no symptoms, if the stone is at least 3 cm in size or if it is associated with complications. Laparoscopic cholecystectomy (keyhole surgery) refers to making a small incision in the navel, approximately 2 cm long, through which gas is delivered to inflate the abdomen. Then, telescopes and other laparoscopic tools are used to resect the gall bladder. Compared to open surgery, laparoscopic surgery is less painful, has a quicker recovery period and produces less scarring. However, if there is severe inflammation around the gall bladder or if the bile duct is obstructed, it may be difficult to perform a laparoscopic operation. In such cases, open surgery may be required. If there are stones in the bile duct, ERCP (endoscopic retrograde chjolangiopancreatography) may be performed first to remove the stones in the bile duct, followed by laparoscopic cholecystectomy. Stones in the liver can cause cholangiocarcinoma, so the affected area of the liver must also be resected. 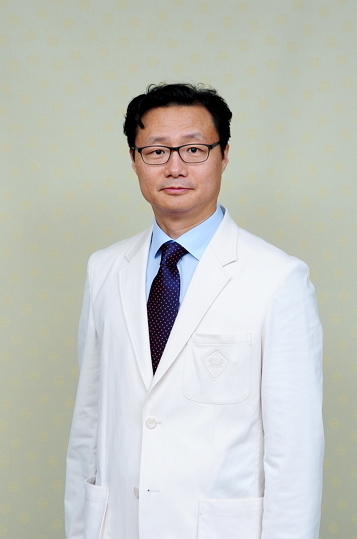 Heo Jin-seok is a doctor in the division of gastrointestinal surgery at Samsung Medical Center in Seoul and a professor at Sungkyunkwan University’s School of Medicine. ― Ed.